Solomon JOHNSON Sr. (c. 1601 – 1690) was Alex’s 11th Great Grandfather, one of 4,096 in this generation of the Shaw line. Solomon Johnson was born about 1601 in Clerkenwell, London, England. His parents were John JOHNSON and Hannah THROCKMORTON. He was christened in of Sudbury, Middlesex, Mass. He married Elinor (Eleanor) CRAFT (Croft). Solomon died 28 JUL 1690 in Sudbury, Middlesex, Massachusetts. Elinor Craft (Eleanor Croft) was born about 1611 in England. Elinor died before 1654 in Marlborough, Middlesex, Massachusetts. Sudbury 26 Aug 1690 Sudbury, Mass. Solomon Johnson was an early pioneer of Sudbury, Mass. The original Town of Sudbury was the third, Colonial, permanent, Inland Town within the 1639 borders of the Massachusetts Bay Colony. Inland means above the flow of tide waters from the Atlantic Ocean. The first (1635) was the original Town of Concord, then and now the immediate northern neighbor of Sudbury, and the second (1636) was the original Town of Dedham. An inland location was a high risk location for the initial settlers of the original Town of Sudbury, since: there was no possibility of escape by ship if needed; emergency resources were about ten hours away in the Boston area; there was mainly wilderness beyond the southern and western borders of the Town. Solomon first lived in Watertown, Mass. The petition to “The Great and General Court of the Massachusetts Bay Colony” to establish the original Town of Sudbury was made by a group of Colonial residents of the original Town of Watertown. The area within the original Town of Watertown extended west to the eastern border of the original Town of Sudbury. 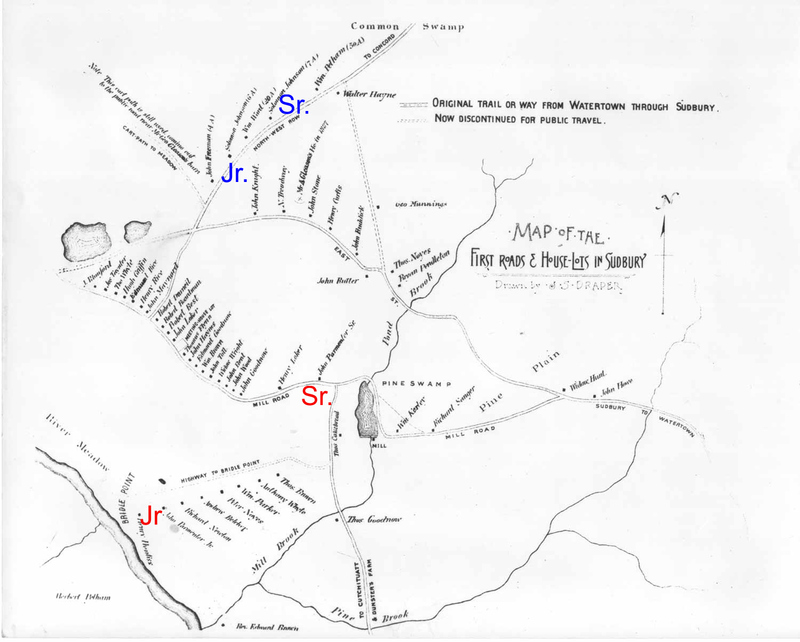 The original Town of Watertown was much larger in area than the present Town of Watertown and also included the present Towns of Weston (the immediate eastern neighbor of Wayland) and Waltham. Solomon Johnson became a freeman in 1651. He was twice married, his first wife, Hannah, dying in 1651. By this marriage he had three children, Joseph or Joshua and Nathaniel, who were twins (born Feb. 3, 1640), and Mary (born Jan. 23, 1644). He married for his second wife Elinor Crafts, by whom he had Caleb, who died young. He assisted in the formation of the Marlboro Plantatation, and was assigned a house-lot of twenty-three acres there. He was selectman from 1651 to 1666. Solomon Sr. was accidentally shot 4 May 1654, Watertown . Midd. Deed III : 139) Dated 25 Apr. 1658. Solomon Johnson of Watertown sells land to his son Solomon Johnson Jr. of Sudbury. (Midd. Deed III : 325) Solomon Johnson of Sudbury, Co. Midd., Junr., sells to Jeremiah Holman of Cambridge one moyty or halfe of land granted by my father Solomon Johnson Senr. called the new grant, 37th lot. Signed by markes of Solomon Johnson Junr. & Hannah Johnson 3 June 1664. In presence of Willia Bordman, Samuel Goffe. Ack. by both 23 June 1664. Rec. 25 Apr. 1666. (Midd. P. Original Papers) Hannah Johnson relict widow of Solomon Johnson late of Sudbury, dec’d, and Caleb Johnson eldest son of said Solomon Johnson, granted adm. 2 May 1691, Charlestown. John’s wife Deborah Ward was born 1637 in Clerkenwell, London, England. Her parents were William Ward (1603 – 1687) and Elizabeth Whale (1613 – 1700). Deborah died 9 Aug 1697 in Marlborough, Middlesex, Mass. (Midd. Co. Ct. Files Apr. 1686) Solomon Johnson aged fifty nine years or their about & John Johnson aged fifty seven years or their about Testifieth and saith that in the yeare fifty one we together Did mow m’ Richard Brown then of Watertown in ye medow that doth ley upon the north of Charls River between Stony Broock and Wattertown plain that then was comonly called m’ Richard Browns medow which is y* medow now in controversy and we moued it for him as his own medow and furder saith not. Sworn 6 Apr. 1686. (Case of Stone v. Bemis & al.). Nathaniel’s wife Mary Plimpton was born 19 Apr 1648 in Dedham, Norfolk, Mass. Her parents were John Plimpton and Jane Demant. Mary died 27 Nov 1736 in Marlborough, Middlesex, Mass. 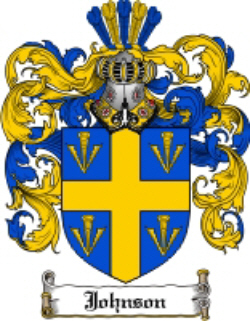 Johannah’s husband John Barnes was born in 1637 in Sudbury, Mass. Some sources say that Jonathan married Mary Kerley, but a different Jonathan Johnson who was born Jan 02, 1667/68 in Marlboro, Middlesex, Mass. married a woman of the same name a generation later. His parents were Jonathan Johnson and Mary Newton. His grandparents were William Johnson and Elizabeth Story. This Jonathan died Oct 12, 1708 in Marlboro, Middlesex, Mass. He married Mary Kerley Dec 24, 1689 in Lancaster, Worcester Co., Mass., daughter of Henry Kerley and Elizabeth White. She was born Oct 04, 1666 in Lancaster, Worcester Co., Mass., and died 1741. Mary’s husband William Taylor was born in 1644 in England. Williiam died 28 Jul 1706 in Marlboro, Middlesex, Mass. He embarked aboard the ship Speedwell at Gravesend, England, arrived in Boston 27 May 1656 traveling with no Taylor relatives, age 11. April 14, 1666 – Town of Sudbury votes to pay Dr. John Chamber of Roxbury, on behalf of Joseph Noyes, for medical care to William Taylor, who injured his hand. Q: Was William working for the town? Why was he taken to Roxbury (Boston)? Was Joseph Noyes William’s guardian/mentor? William Taylor m 3rd Mary Cheevers, d: 28 Jul 1697 in Marlboro, Middlesex County, MA, m: 28 Nov 1683 in Cambridge, Middlesex, Mass. This entry was posted in 13th Generation, Immigrant - England, Line - Shaw, Pioneer, Public Office, Twins and tagged Sudbury Mass Pioneer. Bookmark the permalink. 5 Responses to Solomon Johnson Sr.